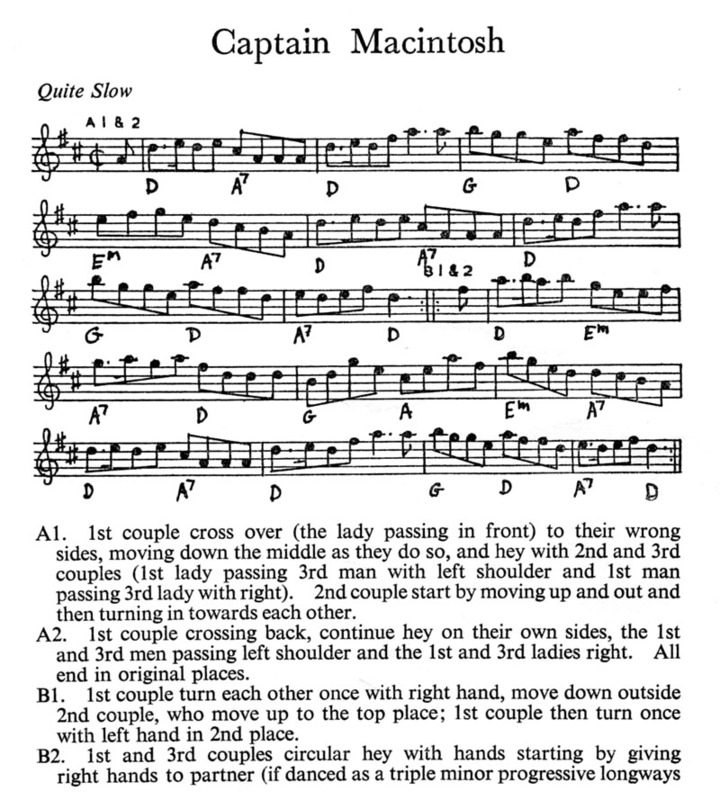 Wilson puts four completely different dances to this tune, so there is clearly no direct connection between the dance and the tune. Any 32 bar reel is fine. I am not quite sure why Pat has put "Quite Slow" against the music. The 1820 original clearly says "Allegro", which my dictionary says means "Cheerful or brisk; but commonly interpreted as lively, fast". 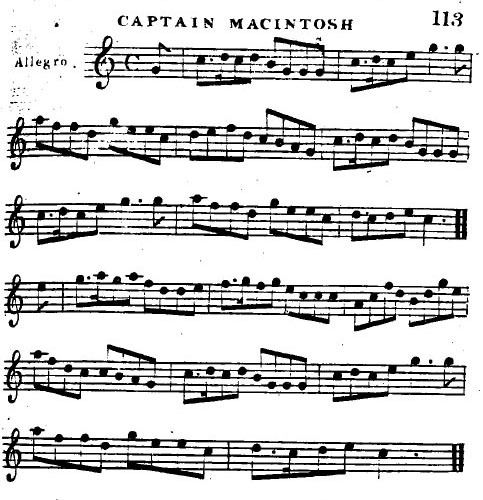 Wilson give four dances under the heading "Captain Macintosh". Two of them are 16-bar dances, two are 32-bar dances. Pat has chosen the second of the 32-bar dances and that is given above as Version 1. The other 32 bar dance is Version 2 above. I have changed the second part of B1 to make a smooth progression for a three couple dance; this does however mean that the active couple changes for B2, but everyone will still get a turn at everything. Wilson defines a "swing" as being with one hand and a "turn" as being with two hands, and of course while doing the swing or turn you should be performing "three Chasses, Jetté and Assemblé". Wilson, like all Dancing Masters, uses the words to mean what he wants them to mean. Fortunately his terminology is all defined in his book "The Complete System of English Country Dancing". So when he says "half poussette" he means what we call a full poussette; when he says "allemande" he means back-to-back; and his "whole figure contrary corners" is defined as I have described above. When I use the term "Allemande" above, I mean hand turns! Wilson's defines a "half pousette or draw" and a "Whole pousette". The diagrams shows smooth circular paths, so it is easy to believe that he means a rotating poussette, what we now call a "draw poussette". However his "Whole pousette" is 1 & 1/2 times and finishes Proper, so it cannot be a rotating poussette. I believe that his poussettes are all forwards and back with no rotation, that the diagrams show the path of movement, not the orientation of the dancers, and that he uses the word "draw" to mean that the move starts with the man pulling. Our use of the word "draw" to mean rotation comes much later. 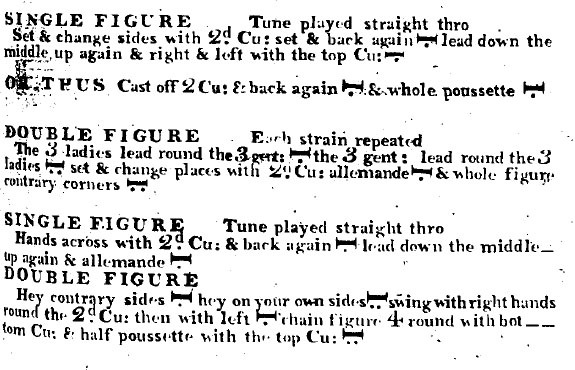 However in this particular dance Wilson seems to provide only 8 steps to get around each other, so a rotating draw poussette, as Pat describes, is probably the best solution. Wilson published thousands of sequences and many of them may never have been danced or tested. This is not the only dance where he doesn't provide enough steps to complete the move, so feel free to interpret the dance any way you wish! This page is provided as a sample during my discussions with Pat Shaw's estate. Pat Shaw was a leading figure in the 20th century dance world. As well as writing his own dances and interpreting dances from the 17th and 18th centuries he also researched traditional dances from the 19th and early 20th centuries. He was a regular contributor to the English Dance & Song magazine. Pat Shaw 1917-1977 gives a flavour of this man of many talents. The Pat Shaw Collection includes over 60 of Pat's own compositions. Another Look at Playford has 120 of Pat's interpetations of older dances.